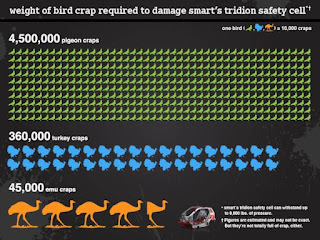 brandflakesforbreakfast: can bird poop damage a Smart Car? 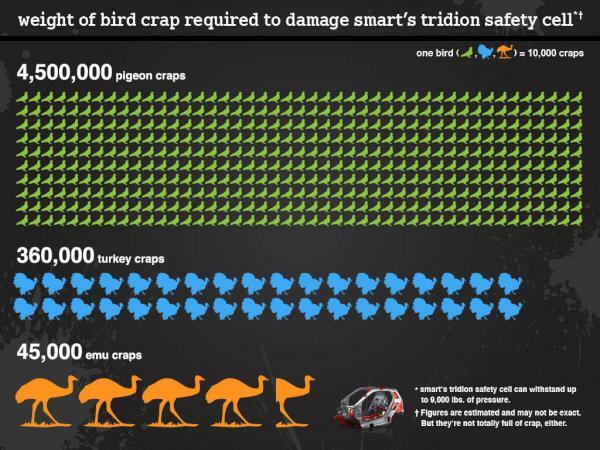 can bird poop damage a Smart Car? When KK Bold Creative Director, Clayton Hove, tweeted "Saw a bird had crapped on a Smart Car. Totaled it." Smart Car could've ignored the tweet, or made some lame joke, or worse, been defensive. Instead they tweeted back "Couldn't have been one bird. Sounds more like 4.5 million (Seriously, we did the math)." and included a link to awesomely hilarious infographic on how many various birds that exactly would be. The idea was from their agency, Razorfish. Kudos guys - love an agency that pushes their clients to do crazy things like this, and love a brand that says "heck yeah!"